731 Lexington Avenue is a 1,345,489 sq ft (125,000.0 m2) glass skyscraper on Lexington Avenue, on the East Side of Midtown Manhattan, New York City. Opened in 2004, it houses the headquarters of Bloomberg L.P. and as a result, is sometimes referred to informally as Bloomberg Tower. The building also houses retail outlets, restaurants and 105 luxury condominiums. The residence section of the building is known as One Beacon Court and is served by a separate entrance. 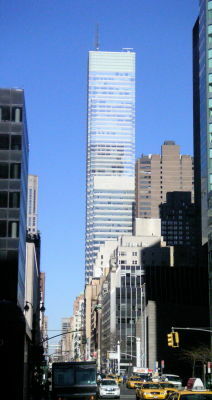 731 Lexington Avenue is a 55-story building with a roof height of 806 ft (246 m). As of January 2019, it is the 30th-tallest building in New York City and the 61st-tallest building in the United States. The building occupies the former site of an Alexander's department store and is owned by the Alexander's real estate investment trust, the successor to the defunct retail chain. Construction on the building began in 2001, three years after the vacant Alexander's department store was demolished. The building was developed by Vornado Realty Trust, as a fee developer, with César Pelli & Associates as architect. The building comprises a full city block between Lexington and Third Avenues and 58th and 59th Streets. The complex features two towers constructed above a steel office and retail section, separated by a seven-story atrium. The design of the courtyard at One Beacon Court, which connects 58th and 59th Streets, was inspired by other historic New York enclosures such as Grand Central Terminal, the reading room of the New York Public Library Main Branch, and the skating rink at Rockefeller Center; glass walls curve around the perimeter of the courtyard, tilting slightly inward as they rise. Although the building was originally planned to be entirely residential, Bloomberg L.P. negotiated a deal with Vornado Realty Trust to lease 700,000 sq ft (65,000 m2) of office space at the base of the tower. STUDIOS Architecture did the design, which includes rows of uniform desks for approximately 4,000 employees and a large central atrium known as "the Link" that overlooks the courtyard. Paul Goldberger, in the August 6, 2007, issue of The New Yorker magazine, lauded the Bloomberg offices as "a newsroom truly designed for the electronic age ... a dazzling work environment tucked inside a refined but conventional skyscraper." By 2011, Bloomberg L.P. added another 200,000 sq ft (19,000 m2) of office space at 731 Lexington Avenue and announced plans to expand to an additional 400,000 sq ft (37,000 m2) in the former Philip Morris building at 120 Park Avenue. Bloomberg pays Alexander's, the owner of the building, $105 million in annual rent. The PBS commentary series Charlie Rose was formerly produced at 731 Lexington Avenue. Bloomberg Television also has its flagship studio in the building. Retail tenants include The Home Depot, H&M, and The Container Store. Sirio Maccioni's Le Cirque restaurant moved to the building from The New York Palace Hotel in 2006, but vacated in 2018. Various low-power television stations transmit from antennas on the top of the building. Residential tenants included Beyoncé, former NBC Nightly News anchor Brian Williams, and Bobby Abreu. Johnny Damon sold his unit for $8 million in 2010. Tina Knowles sold her unit for $5.6 million in 2011. Jack Welch purchased a unit in the building for $6.4 million and Jeffrey Immelt paid just over $4 million for a unit. Hedge fund manager Steven A. Cohen's unit is listed for sale for $67.5 million. Joseph Betesh, co-owner of hip hop clothing outlet Dr. Jay's, owned an apartment in the building from 2005 to 2013, which is now owned by VFT Investments. Residents have access to concierge services by the London-based Quintessentially Group, as well as use of "The Beacon Club", the 29th-floor amenity space that includes a health club, entertainment suite, children's playroom and business center. Other amenities include a 24-hour doorman, garage, and valet parking. ^ a b c d e Gregor, Alison (May 24, 2006). "A Tower Goes Up, and a Neighborhood Perks Up". The New York Times. ^ a b c "Top Projects Completed 2003–2004". McGraw Hill Construction. ^ "Plan/Amendment". Real Estate Finance Bureau. ^ "To Find 1 Beacon Court, Better Ask for Bloomberg". The New York Times. July 9, 2009. ^ Barbanel, Josh (April 3, 2009). "Luxe but Logy". The New York Times. ^ Davidson, Justin (March 22, 2005). "Where the sky is no limit". Newsday. ^ Gregor, Alison (April 23, 2006). "SQUARE FEET: INTERVIEW -- WITH BARRY M. GOSIN; Trained in Manhattan, Graduating to the World". The New York Times. ^ Goldberger, Paul (August 6, 2007). "Towers of Babble". The New Yorker. ^ Bagli, Charles V. (February 9, 2011). "Growing Bloomberg L.P. To Rent Half of a Tower". The New York Times. ^ "Alexander's Inc. 2017 Form 10-K Annual Report". U.S. Securities and Exchange Commission. ^ Bruni, Frank (February 6, 2008). "In Defense of Decadence". The New York Times. ^ Cuozzo, Steve (October 17, 2017). "A final goodbye to the legendary celeb haven Le Cirque". New York Post. ^ Polsky, Sara (March 30, 2011). "Johnny Damon's Old One Beacon Court Pad Back on the Market". Curbed. ^ Kamping-Carder, Leigh (November 18, 2011). "Beyonce's mom moves upstairs into daughter's pad at One Beacon Court". The Real Deal. ^ Clemence, Sara (September 9, 2005). "BImmelt's New $4 Million NYC Pad". Forbes. ^ Walker, Ameena (September 5, 2017). "Steven Cohen's One Beacon Court penthouse is back for half its original ask". Curbed. ^ Maurer, Mark (October 25, 2013). "Dr. Jay's owner sells One Beacon Court pad for $5.5M". The Real Deal. ^ Hosley, Carter B. "One Beacon Court". CityRealty. This page was last edited on 19 February 2019, at 03:35 (UTC).